Couldn't resist adding this BANANA!! 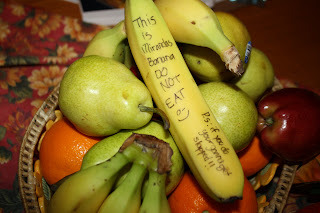 Rebecca had her friends Miranda and Riley over and we found this banana in our fruit bowl. Totally made me laugh! Posted it on facebook telling her mother Patty that maybe Miranda is just a little too comfortable at our house! Here's our cute Rebecca! 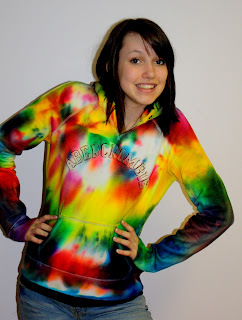 They had a blast tye dying their shirts yesterday and then of course they took pictures and used them for their new profile pics! The kids today are so computer savvy, kind of scary to think of what will come! 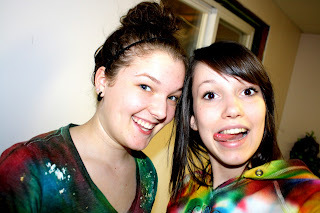 Here's Miranda and Rebecca having fun! I need to blog more! Cathy Zielske is such an inspiration to me, she writes every day and it is funny and interesting. Maybe part of my problem is that I don't really care for my blog and how it looks....so back to the drawing board to see if I can get it looking good so that I will feel like getting to it more!